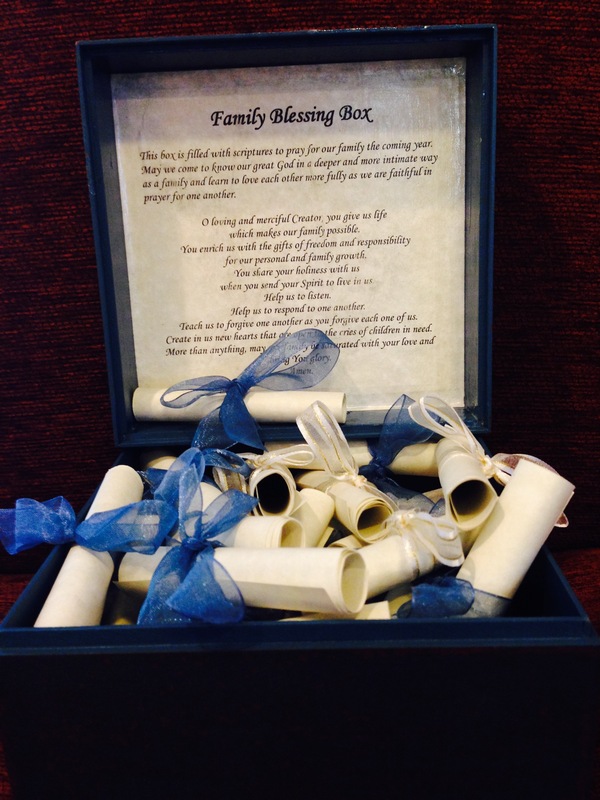 Blessing boxes make wonderful gifts. They are easy and inexpensive to make and are filled with invaluable encouragement and hope. 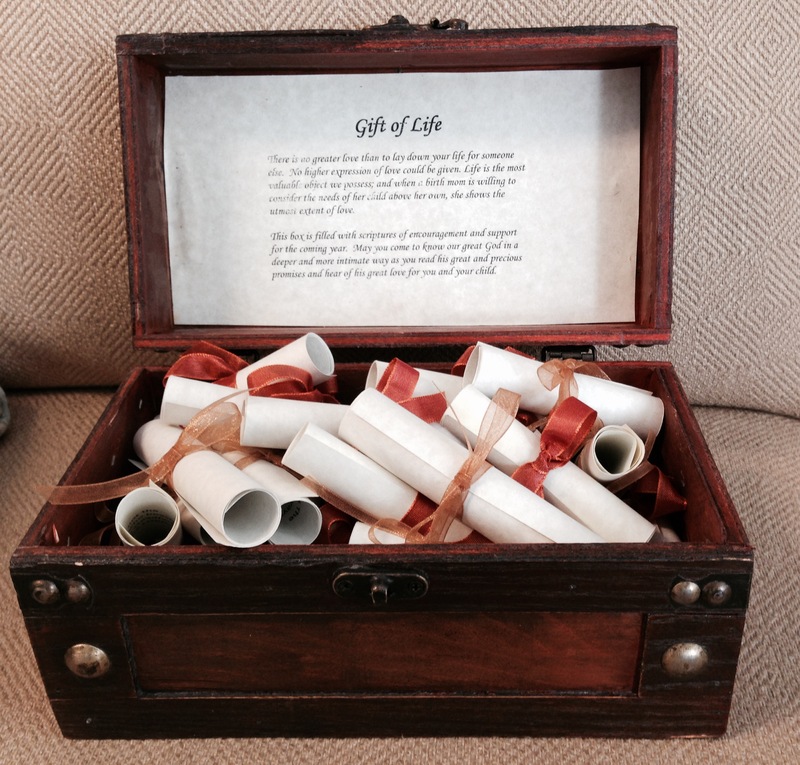 It is a decorative box filled with selected scriptures tied as little scrolls with ribbons. A special message of encouragment is found inside the top cover of the box. I have made many of these and they have become very popular. So, I want to share with you how to make them so that if you want, you can give them as gifts as well. 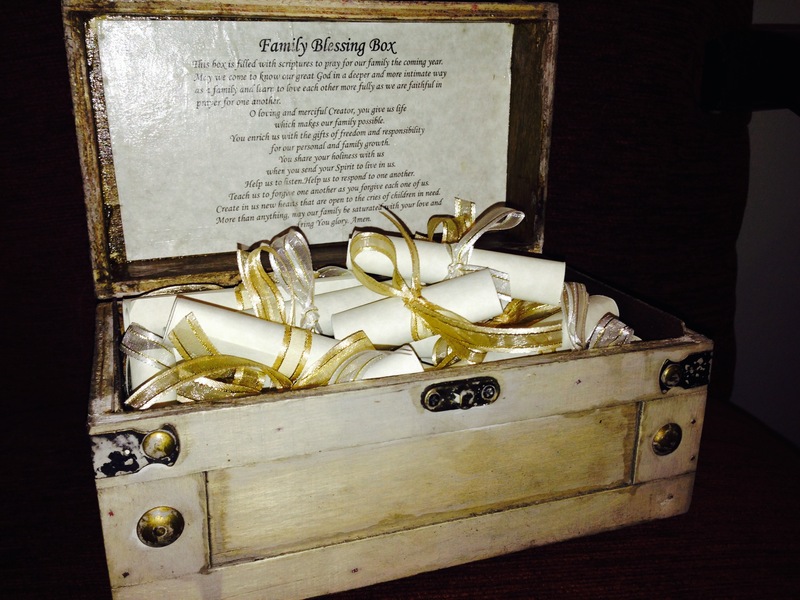 I have given blessing boxes for a wedding gift, new baby gift, new adoption gift, birthday friendship gift, birth mother encouragement box, and general family blessing box. You can go into your local Hobby Lobby or similar store and purchace a decorative box with a lid where you can adhere your blessing letter inside (see picture). They ususally go on sale at Hobby Lobby for half price which is always under ten dollars. You will want the box large enough to hold at least thirty scrolls. Pick a box that fits the occasion. Young and festive if for a birth day. Match the colors for a wedding, etc. 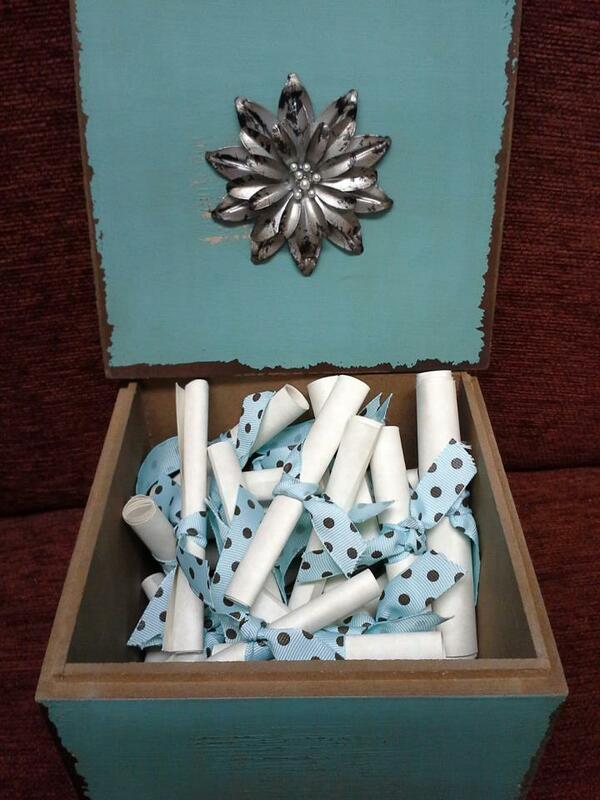 Then choose ribbon that matches the box or complements the color of your box. Choose scriptures for the occasion. You will need about thirty. I am going to provide a few PDFs of verses that I have used for various boxes that you can print. You will want verses that match the occasion and are encouraging and point toward Christ. I like to use verses that magnify the glory of God, his attributes, encourage perserverance and unconditional love. I have a PDF of verses especially for adoptive families that are very encouraging and helpful from Karyn Purvis’s book the Connected Child. If you are printing from one of my PDFs of verses, you will notice that there are three per page. This is so you can cut them out and roll them up individually as little scrolls. If you add verses or use your own, I would suggest making three to a page like this. I am also providing in a PDF the inside letter. When you print, you can enlarge or decrease the size so that it will fit the inside cover of your box well. I use Modge Podge to glue it because it dries clear. You can get this at Hobby Lobby. I am making boxes this year for birth mothers, families that have adopted older children and my children’s school teacher. They make really wonderful gifts and what better gift to give than God’s word and something home made with love! I have added two new types of Blessing Boxes. 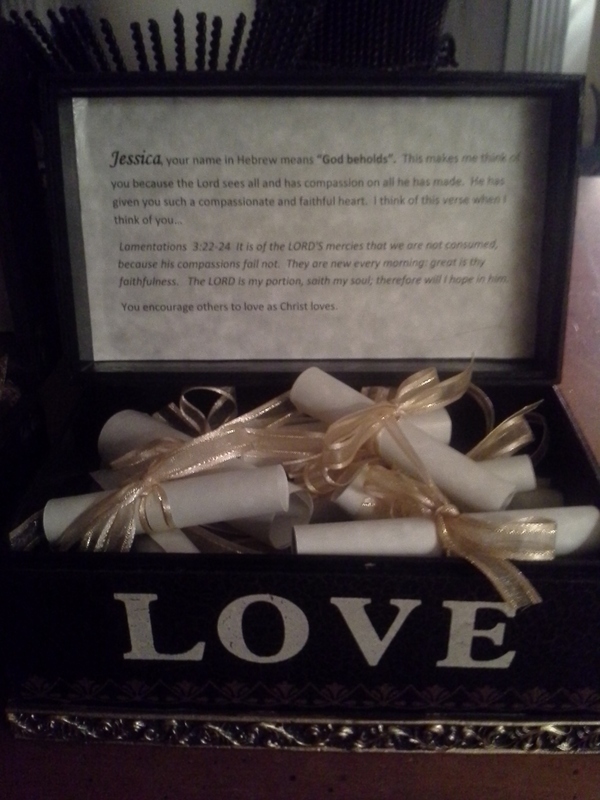 One is the Personalized Blessing Box. I made this one for my son, Zach. I put a letter in the inside lid with his name, the meaning of his name and how God has shaped his character and personality into the amazing young man that he has become. I filled it with verses that I will be praying for him for this coming year. I wanted him to know how much of a blessing he is to our family and how much we love him. I gave one of these boxes to each of my older children this past Christmas. This one is for his precious wife Jessica. 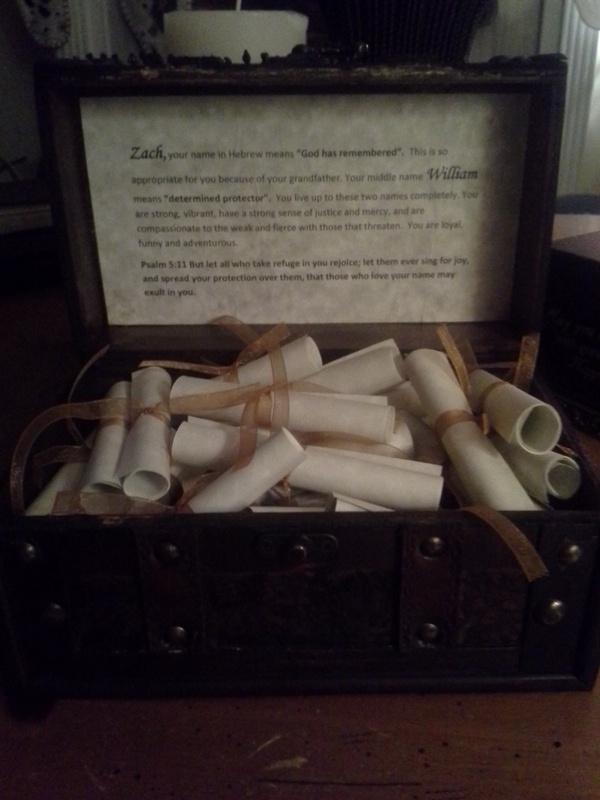 The second Blessing Box that I have added this year is the Ebenezer Box of Remembrance. I actually got this inspiration for this box from our director at Lifeline Children’s Services, Herbie Newell. He is always encouraging us to “remember the great and mighty deeds of the Lord and the answers to prayers that we see daily here at Lifeline.” We have an Ebenezer Wall at Lifeline where we document all of our incredible answers to prayer that happen around our office and with our families. So, I got the idea for a family Ebenezer Box of Remembrance. Two scriptures come to mind for the purpose of this box. One is the entire chapter of Psalm 78. Read the whole chapter. It speaks of remembering and sharing the great deeds of the Lord with your family and children so that the next generation will know them and believe in the Lord your God. The second chapter is Psalm 145 which speaks of the same thing. We got the name Ebenezer Box from I Samuel 7:12 “Till now the Lord has helped us”. 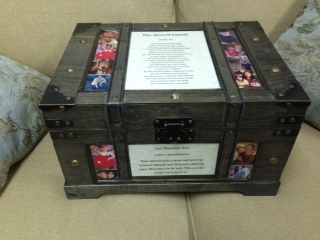 I put the family’s name on the top of the box along with Psalm 78 and pictures of their family. I print this on parchment type paper and glue it with Modge Podge. I also use the Modge Podge to glue the pictures. I put the glue on the back of the paper and pictures, but also put a layer of glue on top of them as well to protect them from wear and tear and possible spills. This box will need to be quite a bit larger than the other Blessing Boxes because of its purpose. The Ebenezer Box of Remembrance is a special box of remembrance to record the great and mighty deeds of the Lord towards your family. It is a special place for recording answers to prayers, keeping small tokens as special reminders of where God has led you and how he has kept you by his mighty hand. Any symbol that triggers a reminder of his goodness is welcome here. All answers to prayer can be included in here. May it be a place where you can record for your children and your children’s children the greatness of our God towards your family. Open frequently and remember together how God has inclined his ear and heard your pleas, cries and whispers. All prayers, especially the prayers of little ones, are most welcome here. 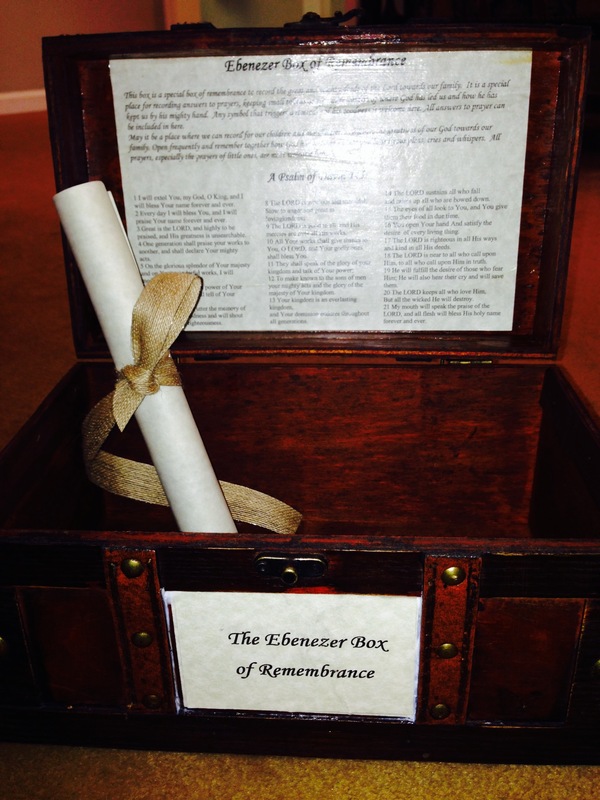 Here is the inside letter with Psalm 145 and explaining the purpose of the Ebenezer Box of Remembrance. You can print this letter and size it according to your box. Glue this letter to the inside lid of your box so that it can be seen and read when it is open. I surrounded this one with pictures of family. I also added pictures to the inside bottom of the box.